Live performance footage of Nirvana playing ‘Scentless Apprentice’ originally recorded on 13th December 1993 has been released today. The band’s Live And Loud show recorded at Seattle’s Pier 48 venue features the final touring lineup of Cobain, Novoselic, Grohl, and Pat Smear in their prime, playing to a packed house. 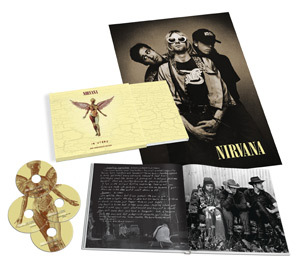 This footage alongside several never-before-released bonus performances, will be released in the super deluxe boxset and separately as a standalone DVD and digital download marking the 20th Anniversary of Nirvana’s polarizing third album In Utero. The unadorned sonic rawness of Steve Albini’s recording laid bare every primal nuance of the most confrontational yet vulnerable material Kurt Cobain, Krist Novoselic and Dave Grohl would ever record. With its 1991 predecessor Nevermind having sold some 30 million copies, singlehandedly returning honest rock ‘n’ roll to the top of the pop charts, In Utero was essentially the first record Nirvana would make with any expectations from the public. From the opening quasi-shamble melodics of “Serve The Servants” through the bittersweet closing strains of “All Apologies,” In Utero was the sound of the most incredible yet conflicted rock ‘n’ roll band of the era at the peak of its powers coming to terms with a generational spokes-band mantle they’d never seen coming-and ultimately surmounting these struggles to make the record they needed to make. 20 Years may have flown by, but this record sounds every bit as intensely moving, fresh and relevant as it did upon its 1993 release. Look out for the 20th Anniversary re-mastered re-issue featuring an all-new 2013 mix of the album alongside the classic 1993 version, plus bonus demos, B-Sides, previously unheard material and incredible live performances set for release on 23rd September via UMC.